Unique battery with specifications and technology primarily developed for extremely hard working conditions, exposure to long vehicle strains, working on high temperatures and the possibility of longer period of non-use during periods when such vehicles are not used (winter). Its uniqueness primarily lies in the exceptional capacity of 110 Ah in the dimensions of the car battery with the unbelievable power strength of 1000 A. 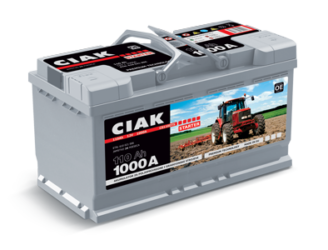 Besides technical advantages, CIAK STARTER TRACTOR PROFI battery was tested in the hardest conditions of use, exposed to strong vibrations, specific ways of use, adapted to enhanced number of consumers such as platforms, cranes, various different implements used in agriculture which use the battery energy. 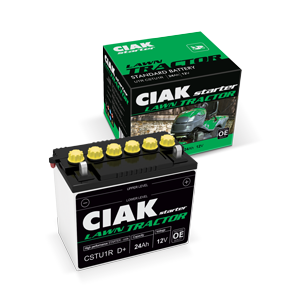 Unique CIAK Starter battery technology is also applied in the production of a special battery for lawn tractors. Powerful performances along with tested quality, recognizable for complete offer of CIAK Starter batteries, is now available in this special line. High level of capacity enables use in the most extreme application. It is perfect for mowing big gardens, fields or for using lawn tractors for the purpose of transport or pulling small loads. It is specially designed to be installed on a lawn tractor with widely designed poles for installation on any type of mowers and with any manufacturer of such special purpose vehicles.